We're big fans of Virender Sehwag here at the Reverse Sweep and like many believe his is a unique and special talent. Yet another century in the 3rd Test against Sri Lanka saw him pass 7,000 test runs in his 79th test match. He averages over 54.5. These are pretty impressive figures. All the more so when you consider that he has got these runs at a strike rate of a tick over 80 runs per 100 balls. That is a rate that most opening batsmen would kill for in one day internationals. 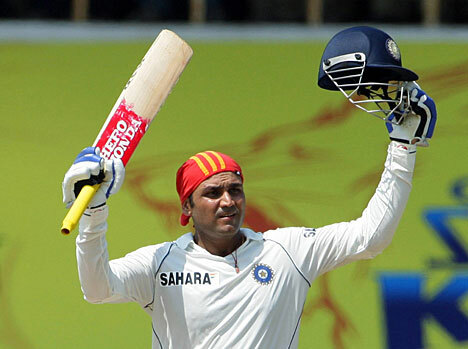 Without a shadow of a doubt, along with Sunil Gavaskar, Sehwag is one of the two best openers India has ever produced. We certainly picked them to open together in our Indian Test XI of the last 30 years. But it seems that Sehwag is hungry to achieve further greatness. He won't score as many test runs, play as many tests or ever get the same adulation as Sachin Tendulkar. However, he is on the hottest of red hot streaks at the moment and if he continues, could reshape the approach of batsmen to test cricket for a generation. In his last fifteen test innings, Sehwag has scored 1282 runs with six hundreds and four fifties at a Bradmanesque average of 91.57. Even more impressive is the strike rate of 97.56. To score that volume of runs at more or less a run a ball, even if all the test matches have been held on the traditionally batsman friendly wickets of the subcontinent, is truly phenomenal. We are hoping (clearly in vain) that Alastair Cook is paying attention and learning.